For U.S. Navy SEAL, Bowie “Ruckus” Cooper, going on a mission into the most dangerous place on earth wasn’t new, neither were the orders to tag and bag an international criminal, but when Bowie finds a captive American reporter, that wasn’t exactly run of the mill. Neither was getting separated from his squad, teaming up with her or protecting her against all odds, while working to keep his hands from around her neck and off her delectable body. 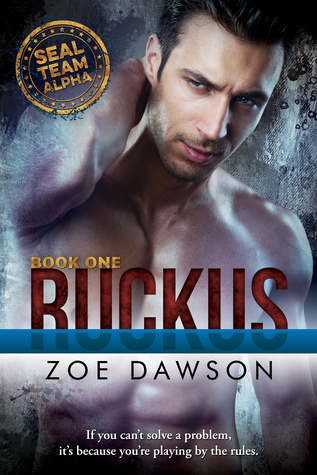 Seal Team Alpha series starts out with Ruckus by Zoe Dawson. This is a fast-paced edge of your seat kind of romance. I really super loved these characters. They have dimension and lots of spirits. Dana: she gets an email from her dying mom. Her mom wanted her to tell some people’s stories. To make the public aware of what was happening and how they should get involved and stop it. Her mom was surgent at doctors without borders. Her dad had been a nurse with them. Since Dana was a writer and this was her mom’s dying wish she would do this come what may. She also was a filmmaker, photographer, and contributing editor to a humanitarian journal. She has been a war correspondent as well. She could handle stressful people and dangerous ones too. Despite the dangers, she would make sure these people go their stories told. Ruckus has 20 years in the Seals. Seven other Seals were with him as his deployment team. They were his family, his brothers. Ruckus had no other family since he was 17years old. They run into Dana when they are sent in to take down some drug lords. Dana is sassy and loyal. She is not easily intimidated. She gives Ruckus a hard time, but Ruckus loves her spirit. She is what he has been unknowingly looking for all his life. Now that he has her can he keep her alive long enough to claim her as his forever? Really well-done story. Strong characters and action-packed. I cannot wait for the other men in Ruckus’ group to fall in love. I want to read their stories and find out who is strong enough to love them back.